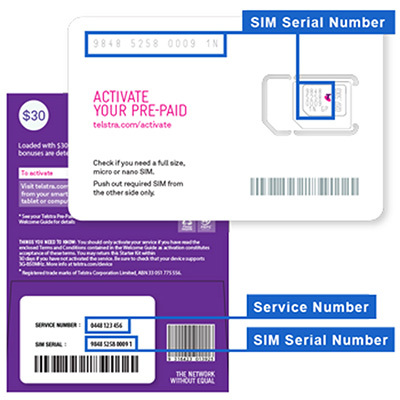 How do I activate my Telstra Pre-Paid SIM Card? See below: they’re on your SIM Starter Kit or the packaging your device came in. On your smartphone, tablet or desktop, go to telstra.com/activate and follow the prompts. You don’t need an internet connection or credit balance to access this page. What if I’m keeping my existing number? Follow the prompts to switch your number over to Telstra. Make sure the details you provide us are an exact match to the details held by your current provider, such as the spelling of your name and date of birth. It can take up to 48 hours for your number to switch to Telstra. While you’re waiting you can keep using your current service. How do I know when it’s switched? Your service with your previous provider will stop working. We’ll also send you an SMS or email as soon as your number has come over to Telstra. Once your Telstra Pre-Paid service is active, you may need to recharge. Get more tips to manage your Pre-Paid service here. What if I’m using an existing device? that your mobile supports Telstra’s network. Check the manufacturer's website or our online device guides. that you have the correct data settings. These let you browse the internet, send emails or MMS. 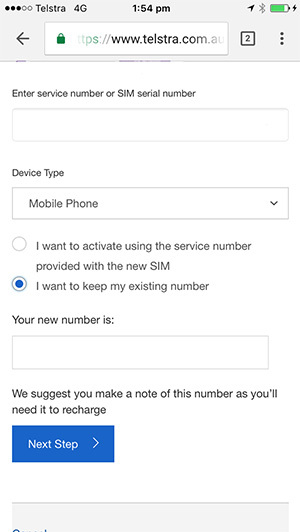 Many mobiles will have their settings updated automatically over the Telstra network. To find out if your settings are updated automatically, visit Mobile Support or check the manufacturer’s website.